REIKU cable protection sleeving / cable sheathing is used in bundling of electrical wires and cables against foreign influences and disturbances. REIKU-system-sheathing can be applied on already assembled wiring. Four closures variation can be combined with five kinds of material of REIKU-programs. 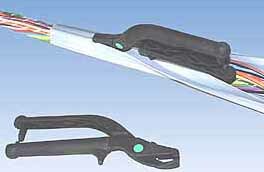 Wrap cables with the sheathing and close them - a simple gliding motion. Contact us Today for superior cable protection sleeving / cable sheathing solutions!